This Common Core resource packet was created to support educators as they strive to understand the Common Core Reading Literature Anchor standard 2 in a deeper way. 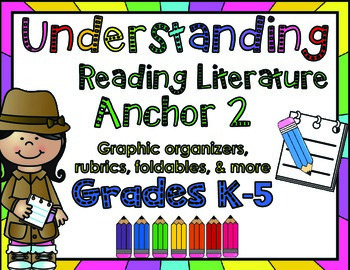 Teachers, Instructional Coaches, and Administrators will find an explanation of the anchor standard, RL.2, as well as graphic organizers on RL.2 for grades K-5th grade. 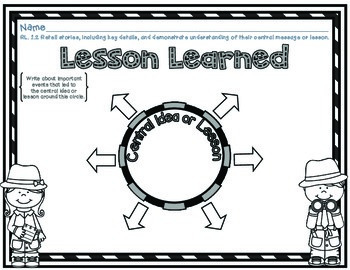 There are also foldables, posters, I Can statements, and rubrics for each grade level. This includes RL.K.2, RL.1.2, RL.2.2, RL.3.2, RL.4.2, and RL.5.2. 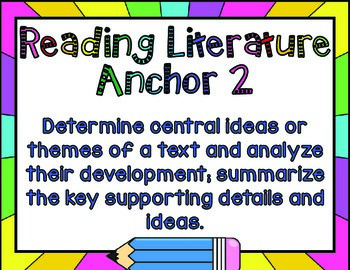 This anchor requires students to determine the central message or theme of a text and to analyze the development of that theme and to summarize the text. Since the anchors are vertically aligned, the anchor is then wisely broken down into "baby steps" for each grade level, beginning with kindergarten. The organization of the standards in this way helps educators not only to better understand the expectations of each standard, but also assists in differentiating assignments for students with varying needs and abilities. A second grade student reading on a fourth grade level may be encouraged to complete the fourth grade graphic organizer instead of the second grade one. This student would still be working on the same skill, determining the central message or theme, but at a deeper level than a typical second grader. Students leaving school today without strong literacy skills will have a difficult time competing for quality jobs. Knowing this fact, the CCSS place a strong emphasis on reading complex texts with a high level of comprehension. 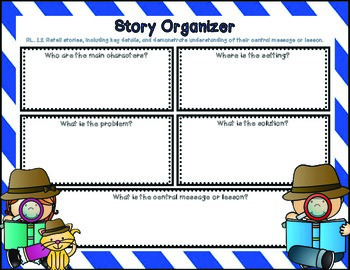 Even young children are asked to analyze stories, note important details and different points of view, and compare texts, authors, and themes. Since the responsibility for interpreting and effectively implementing these standards rests on the shoulders of teachers and administrators, it is crucial that we understand them the way they are intended to be interpreted. The intent of this resource is to support educators as they strive to understand each Common Core anchor standard, and as a result, strengthen their instructional practices. Hopefully, as educators become stronger and more effective teachers, they will provide a context in which students are invited to become lifelong learners. Thank you for checking out this product! I hope it will be a resource that will be useful to you and your students!